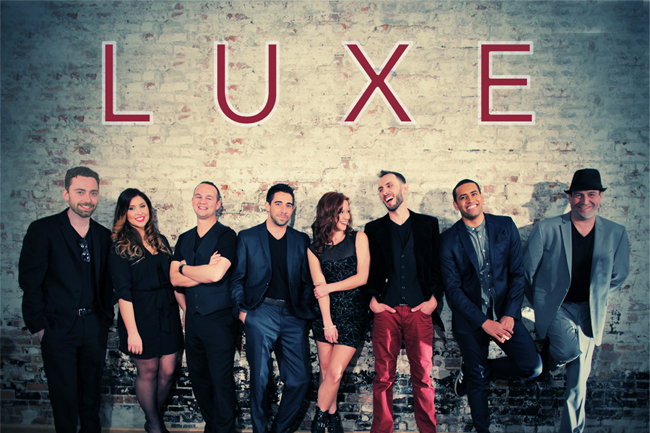 Luxe combines pop, R&B, jazz, funk, rock and everything in between. With Luxe you don’t only get entertainment but an experience that will pull you out of your seat and straight on to the dance floor. Their unique spins on classic and contemporary hits, intricate harmonies and eye-catching choreography will simply blow you away! Having shared the stage with superstars such as Jay-Z, Coldplay, Fun, Britney Spears, Jessica Simpson, Billy Joel and many others, the members of Luxe have appeared all over the world from Paris to Rio, Sydney to London and LA to New York. For non-stop excitement, that you and your guests will not stop talking about, Luxe is your newest choice. “Incredible”, “the most fun we have ever had”, “this band is going to be hard to top at any future wedding we go to” – these are just a few of the comments from our guests and we cannot agree more. You guys kept everyone on the dance floor all night and everything flowed so perfectly. Even our 91-year-old grandfather and his friends (who claim they are very picky with music and don’t often dance at weddings) were on the dance floor multiple times throughout the night. We hired LUXE for our wedding on 10/22/17 and they were more incredible than we could have ever imagined! Frank and team were so nice and played with an amazing, infectious energy, not to mention supremely talented! The even went above and beyond to help me plan a special surprise for the big day. There are no words to express how amazing they were so I’ll just say this: book LUXE now and you won’t be disappointed! Luxe Band was absolutely amazing. Everyone was dancing the entire wedding and no one wanted the music to end. We got SO many compliments on the band and everyone was saying it was the best band they've ever heard! Frank the band leader is so great and makes the process easy. He meets with you beforehand to go over songs/genres, follows up a few weeks before for a call to go over your timeline, and ensures he pronounces everyone’s name right for introductions. The entire process was great - highly recommend Luxe!!!!! Our wedding at the Palace Hotel was incredible thanks to Luxe, the band we booked through Hank Lane. The number one compliment we've received about the wedding was on our music and how this was the most fun wedding anyone has ever been to. No one was sitting at their tables all night because the action was happening on the dance floor. Not only was the event itself above and beyond expectations, but we were very impressed by the level of pre and post event communication to make sure that every single detail in the wedding timeline went off without a hitch. The band even learned special songs not included in their repertoire for our friends, which were a huge hit. The band was a big expense in our wedding, but worth every penny!